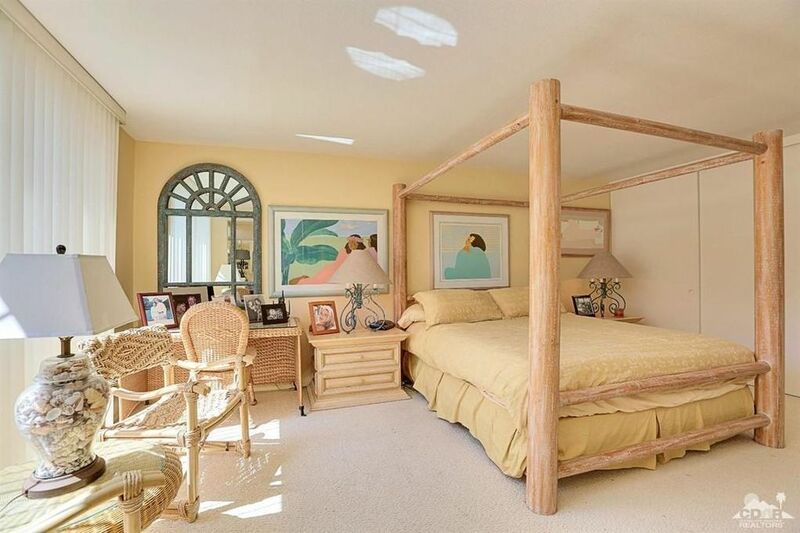 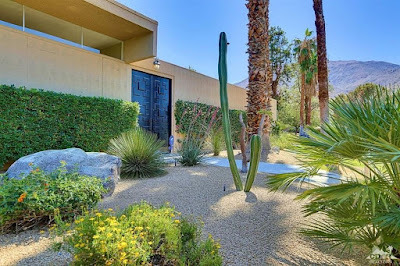 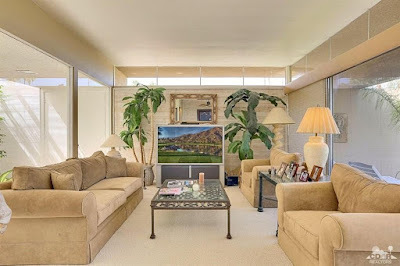 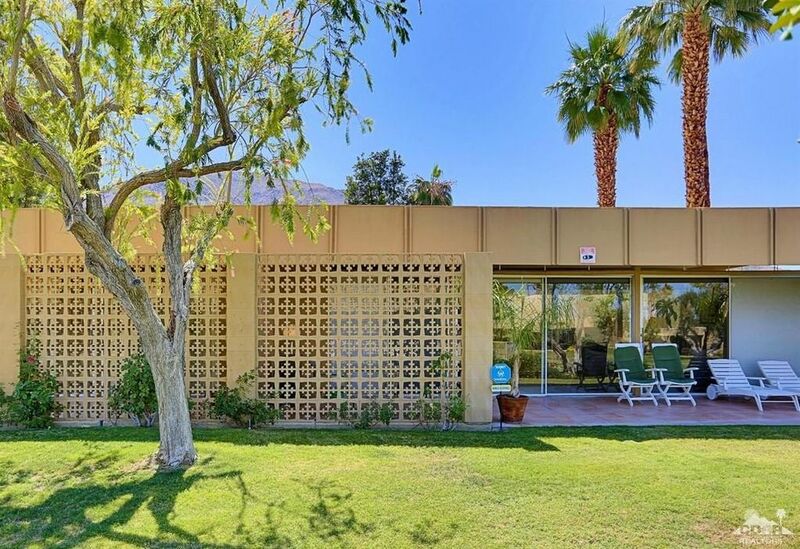 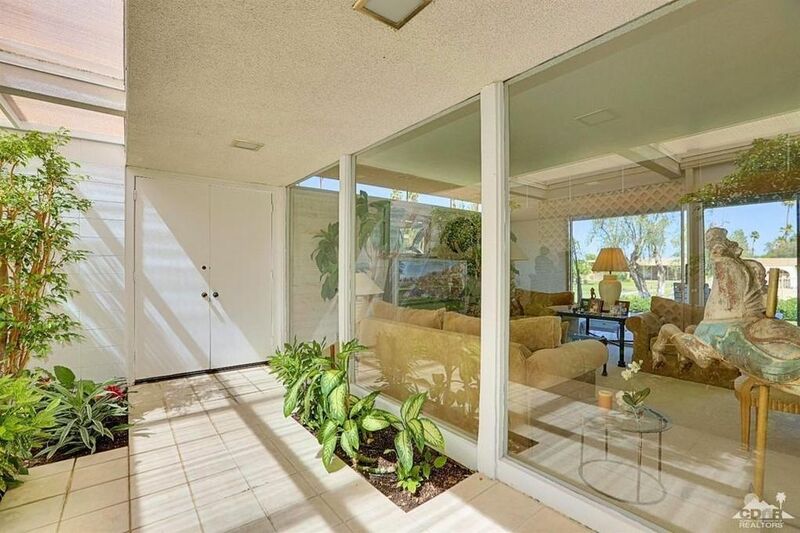 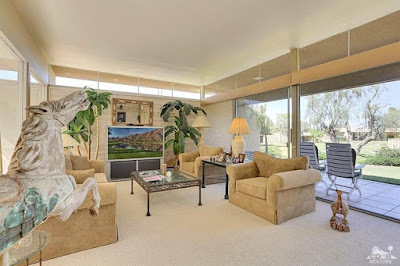 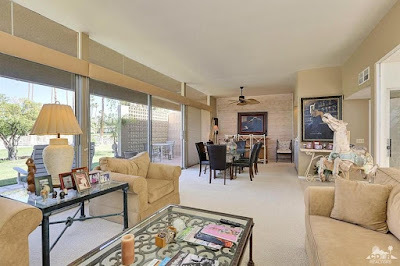 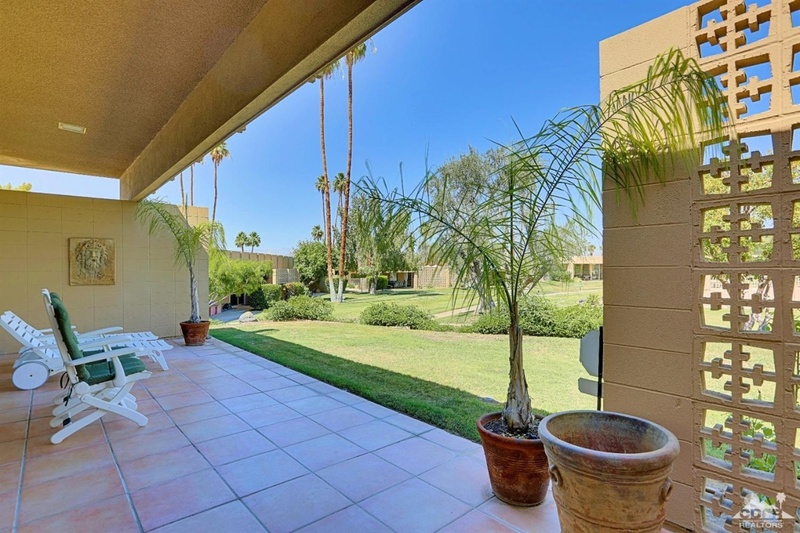 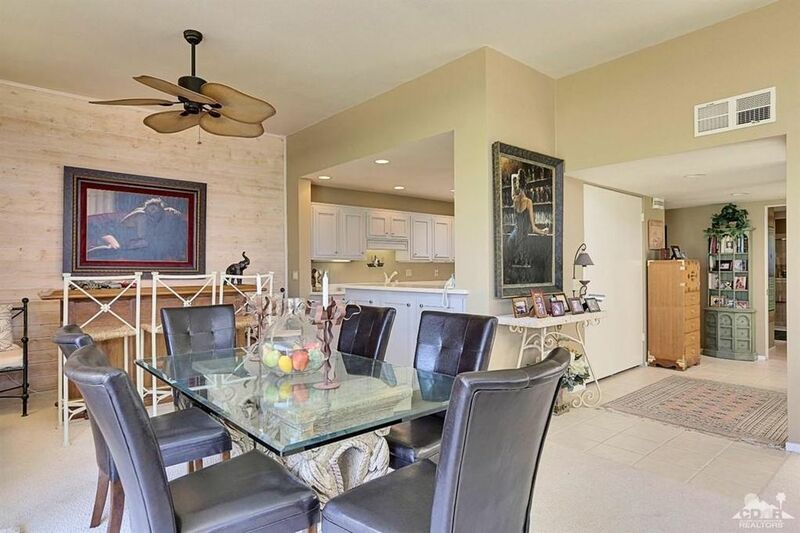 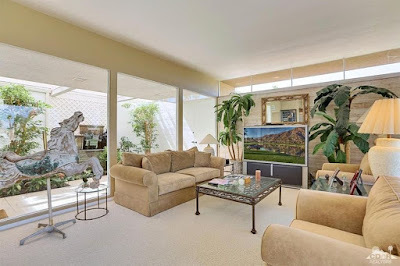 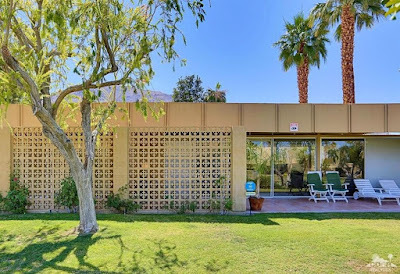 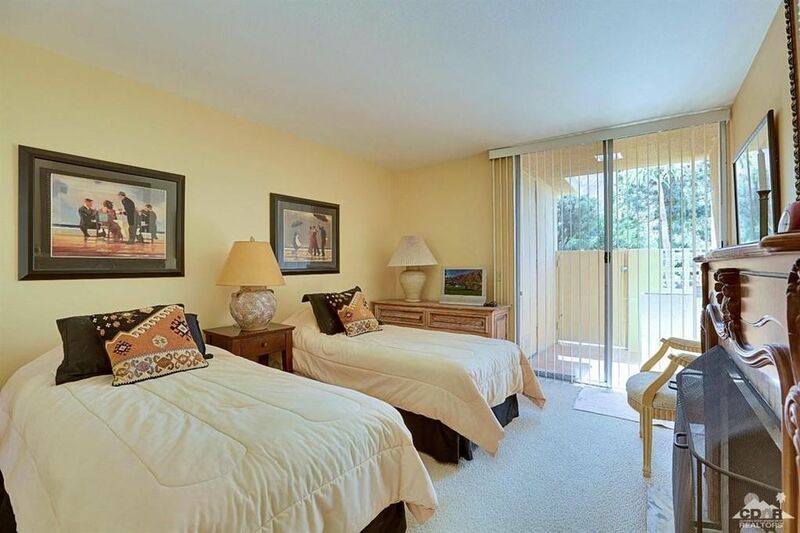 On the market in Palm Desert, CA is this 1965 Palmer & Krisel-designed condominium in the Sandpiper community. 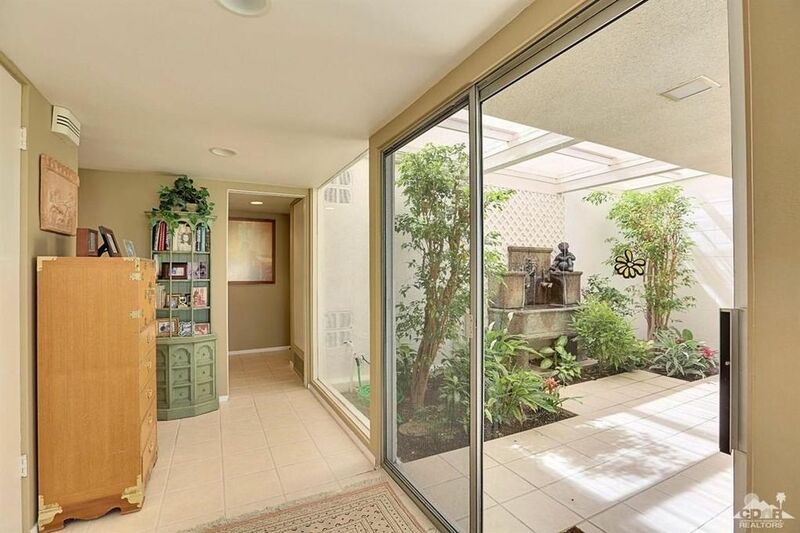 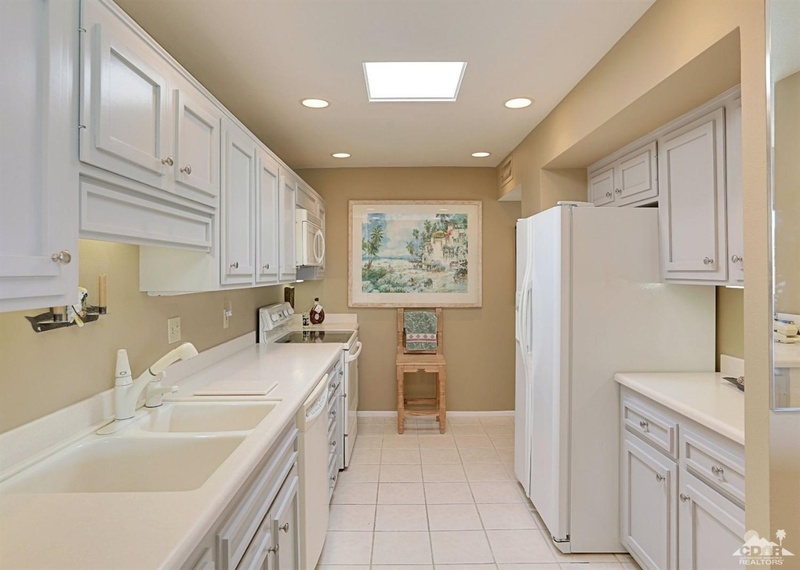 With its own private atrium off the entry, this home includes two bedrooms and two bathrooms in 1,531 square feet and carries an asking price of $429,000 with monthly HOA dues of $650. 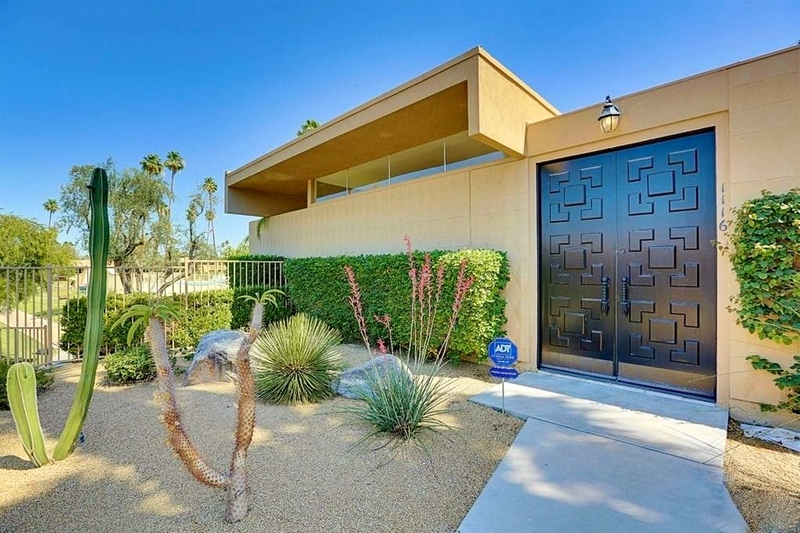 Like most of the Sandpiper units, the front of the home is modernist in style, with a pair of double doors set amongst a full wall of diamond-patterned shadow block. Clerestory windows set below a deep overhang float above the shadow block wall, and sculptural cacti and succulents sit adjacent to the entry. 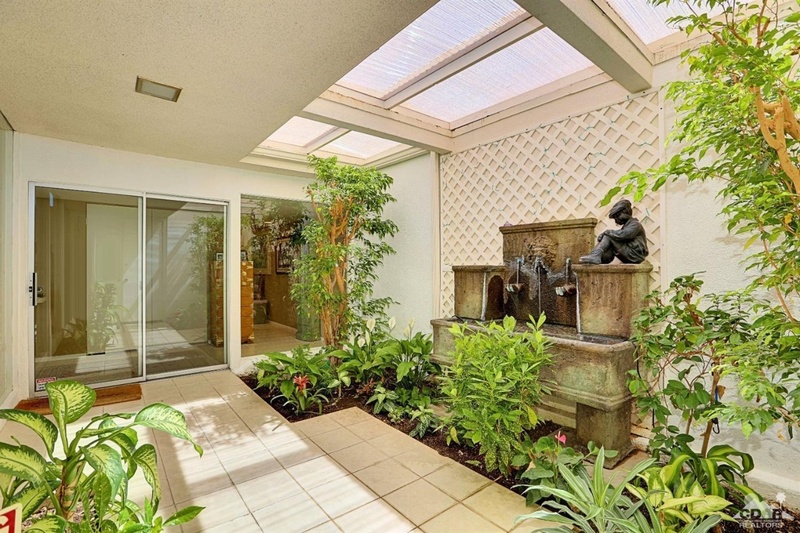 The front entry leads into the private courtyard, filled with lush plantings, a small fountain and walls of glass looking into the living areas of the home. A large sliding glass door leads into the home, with the living room surrounded on two sides by walls of glass, one overlooking the courtyard and the other overlooking the rear patio and Sandpiper common area. 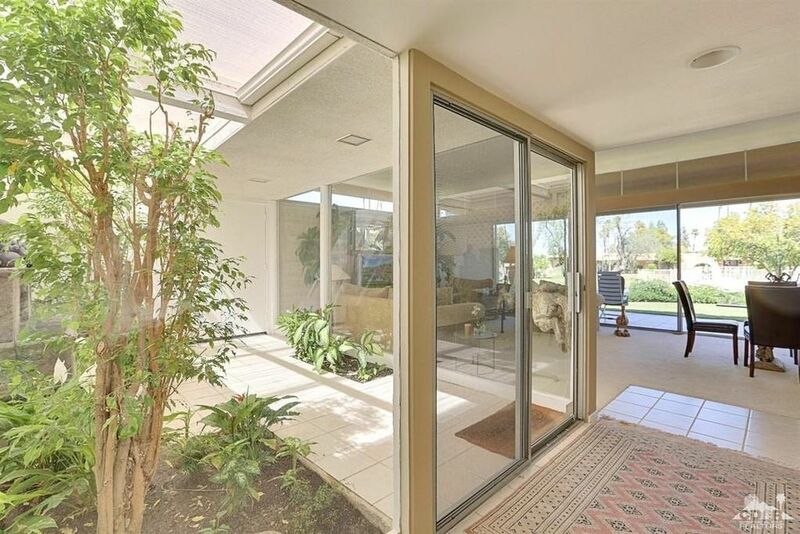 Clerestory windows seemingly float above the space, creating an inviting light-filled room. The dining room sits opposite and open to the living room, and also features floor-to-ceiling windows overlooking the rear patio and exterior decorative screen blocks. 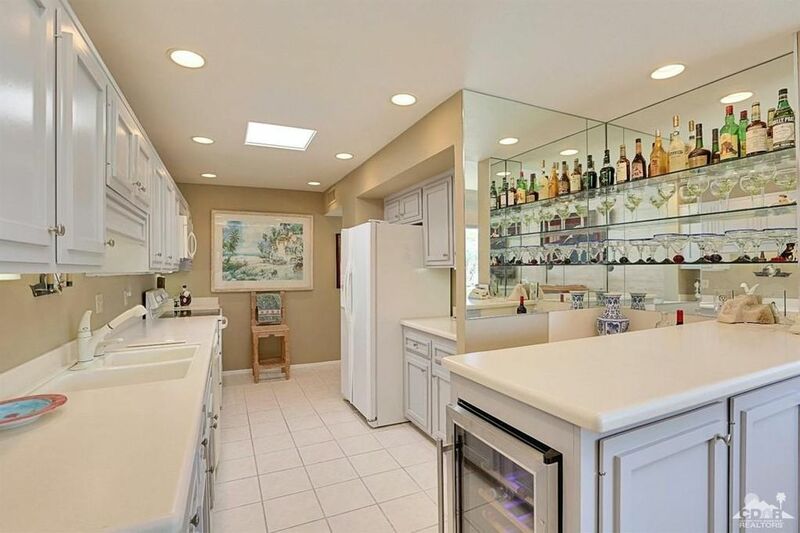 The kitchen features a large pass-through to the dining room, with a small mirrored bar area complete with wine fridge set adjacent to the pass-through. 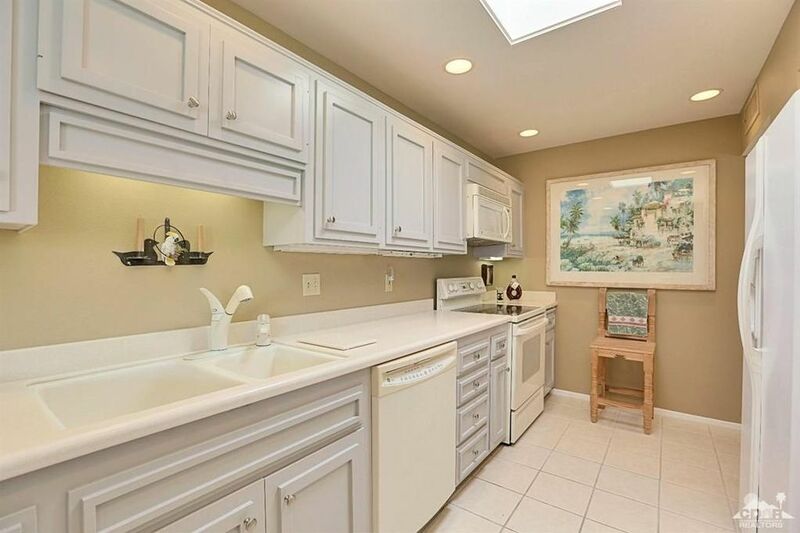 The rest of the kitchen has been updated with traditional materials, including raised-panel cabinetry and white appliances. The master bedroom sits at the side of the unit, generously proportioned with a large sliding glass door overlooking the private bedroom patio. 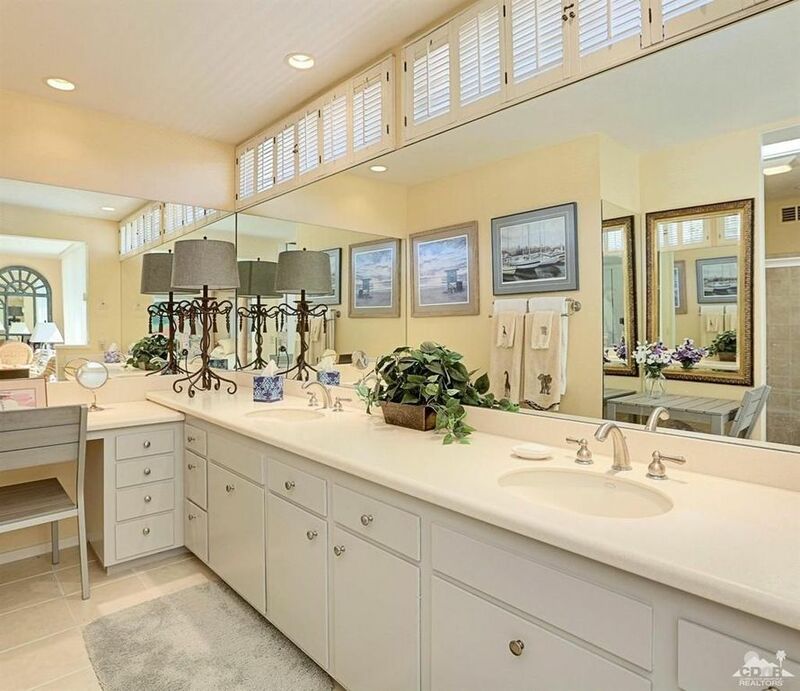 The master bath is similarly generously proportioned, and provides a large double vanity with clerestory windows thoughtfully positioned above the mirrors. 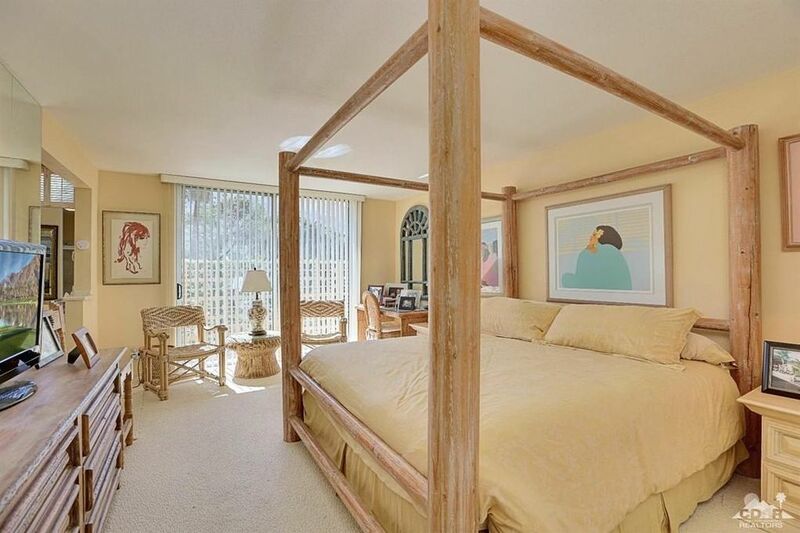 The secondary bedroom also sits at the side of the unit, sharing the private patio with the master, and features a large floor-to-ceiling sliding glass door allowing for natural light to flood the room. 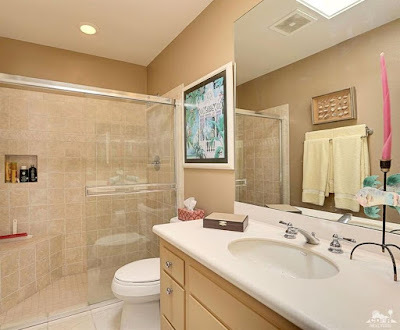 The guest bath has been updated over time, and while it is clean and function, isn’t modernist or fitting with the unit. 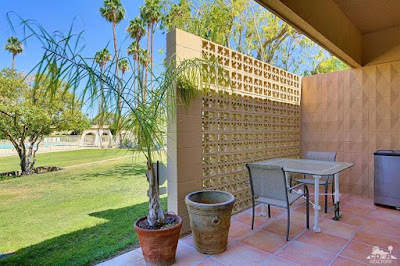 The common area patio sits slightly elevated above the main Sandpiper common area, complete with wide sunflap and decorative screen block. Side privacy walls allows for a sense of enclosure while still remaining open, a design trait that Sandpiper is well-known for. 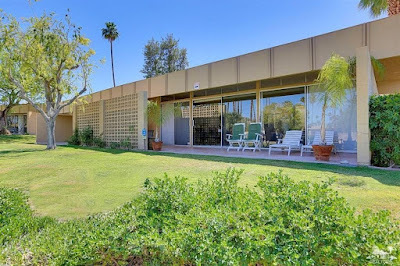 This unit offers garden-style modernist living, and is move-in ready to be enjoyed as-is or renovated back to its midmod roots over time.